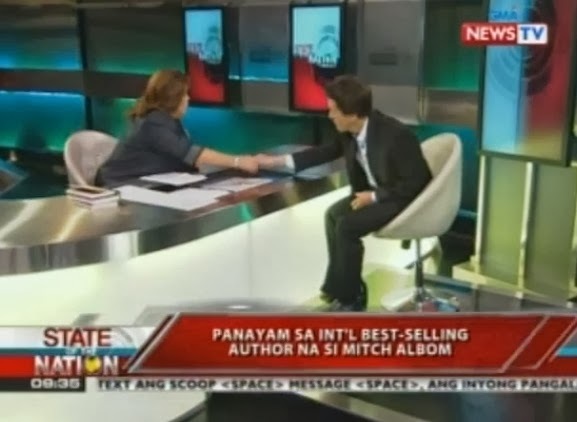 Jessica Soho has once again proved that she's the go-to interviewer in 9 o'clock news as she was able to land a live interview with best-selling author, Mitch Albom, on State of the Nation Thursday evening. Albom, author of the New York Times bestseller "Tuesdays with Morrie," is currently in the country to promote his latest book, "The First Phone Call From Heaven," as well as to draw more attention to the victims of super typhoon Yolanda by visiting Tacloban on Monday. "To be honest, I've been asked to come to the Philippines every year for the last 10 years, and I always say no because it's very far away, and you know I get asked to go to a lot of places. When I saw what happened with the typhoon, I was very moved," he said. "I've seen what devastation looks like and I realized how sometimes victims can be forgotten after a certain amount of time. Everybody moves on the another story." Albom also added that he will donate 40 boats and will try to reopen some libraries with the help of his author friends in the U.S. "It wouldn't be a reason enough for me to just come here if all I was going to do is to promote my book. That's a little self-serving. But if I can do that, and maybe help in the situation up there a little bit, then it makes the trip worthwhile," he said. When asked about his secrets to writing a best-selling novel, Albom said that he doesn't have any formula. "You have to find something in your heart that really matters, first of all. You can't just write a book for formula or look like it's a book written for formula." Albom also sat down with the likes of Karen Davila for Headstart, celebrity talk show host Boy Abunda for The Bottomline and Claire Celdran for Solar Daybreak, for an interview airing next week.